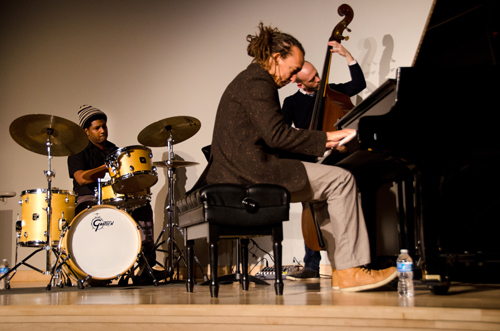 The Gerald Clayton Trio played to one of the largest Harker Concert Series audiences to date on Jan. 20, a fine night for an indoor show, given the rainy weather. Middle school music teacher Dave Hart introduced Clayton, 27, a three-time Grammy award nominee who has worked with greats such as Roy Hargrove, Lewis Nash and Clark Terry. Joining him on drums was Justin Brown, a graduate of the Dave Brubeck Institute and Juilliard, attending both on full scholarships. On bass was Matt Brewer, a professional performer since the age of 12 and a highly in- demand sideman, according to Clayton. Appearing the very portrait of concentration, Clayton put hand to keys, performing a dissonant improvisation before segueing nicely into a slow and soft rendition of the standard “It Could Happen to You.” Brown used his brushes to great effect, adding an ethereal touch to his steady, nuanced technique. Both he and Brewer contributed the first of many tasteful solos that evening, while Clayton’s increasingly dexterous playing brought the song to an exciting finish. Clayton followed up with “Major Hope,” an original composition that began with rapid staccato chords in shifting times, gradually swelling into an upbeat display of musicianship, featuring Clayton’s fluid improvisational skills and Brown’s exacting touch. Roger Kim ’07, who studied music at the University of California, Berkeley, was also impressed with the show. “I see a lot of jazz, and this definitely was a unique experience,” he said, mentioning that the Clayton concert was among the best he’d seen.